I’ve been trying to drink more water for a very long time but have never succeeded in increasing my water intake until recently, so I want to share how I got myself to drink more water. Every morning I’ll have a cup of water after I’ve got out of bed and settled my needs in the bathroom. Since I’ve been doing this for years, it’s an automatic thing for me now. It has become a habit and part of my waking up routine. Since I spent most of my day in my room, mostly sitting at my desk working on the computer, I have a cup and a bottle that’s always on my desk. Before I sit down and start doing anything, I’ll make sure the cup and bottle are filled with water. With water available around me, I’ll have the tendency to drink the water while I’m working or playing games on the computer and not go without water for hours. For me, my reminders are the coasters that I put my cup and bottle on. Don’t the coasters look cute? 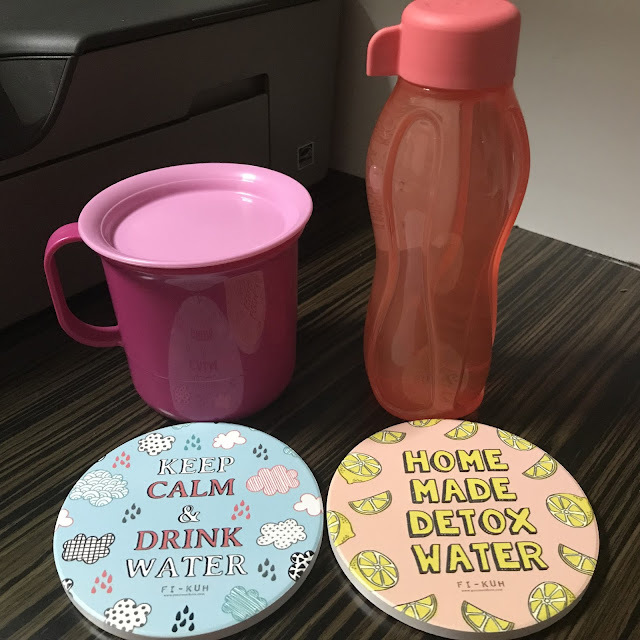 I especially like the blue one that says ‘keep calm and drink water’ but actually, just having the cup and bottle filled with water around me is a reminder for me to drink water. Another way that I reminded myself to drink water but don’t use it now is an app on my phone. I used an app called Daily Water to track how many cups of water I drank everyday and to schedule reminders. When it’s time, there will be an alarm and notification. In fact, the alarm app can be a reminder as well by having the alarm name set to drink water. As mentioned above, I always have a bottle of water on my desk but that bottle is not only for my desk. The reason I have one cup and one bottle is to bring the bottle out. Whenever I’m going out, I’ll make sure I bring the bottle of water. I’ll make sure I drink a cup of water after my lunch and dinner. Not for breakfast because I’ll have my daily dose of coffee after breakfast and since I already had a cup of water shortly after waking up which is just before having breakfast. From drinking 1 to 2 cups of water a day which is the cup every morning and another cup later in the day, I’ve managed to increase my daily water intake to 4 to 5 cups a day. It is now not only the cup of water every morning and one additional cup later in the day but more cups throughout the day. Despite my mom’s constant reminders to drink more water for the benefit of my health, I still couldn’t increase my water intake. Now my mom no longer reminds me to drink more water since I’ve been drinking more water and it’s actually all the 5 ways together that help me to drink more water, not just one which I’ve tried but didn’t work.